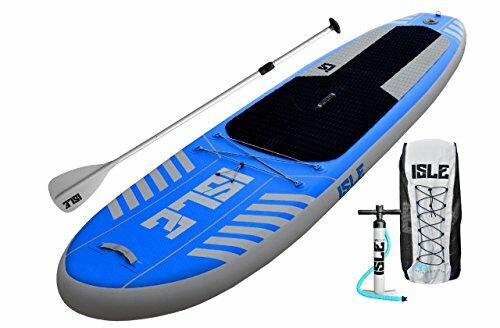 If you are looking for an iSUP that can do anything at all, you may be interested in the ISLE Airtech Inflatable Paddle Board. It promises to do everything you want for it to do and has the warranty to back it up. However, it may not be perfect for everyone. The Isle Airtech can support up to 200 pounds and the board only weighs 24 pounds. There is a deck mounted bungee system that allows you to easily carry all the gear you need to take along with you on your next adventure. It has a surf style design to make it one of the few all-round inflatable boards. You can do anything with it, especially since it is built using military grade materials to give it extreme durability. It can handle small waves, rivers, and flat water. It is stable thanks to the fact that it is 10ft long by 31in wide and 6 inches thick. This means it is great for beginners and experienced boarders. The Isle Airtech comes with everything you need to get your adventure started. You get a travel paddle, an air pump, the fins, and a repair kit in case of a major problem. The high pressure pump easily inflates the paddle board to 15psi. The paddle floats in water and it is made using three pieces of aluminum for easy storage when not in use. When you are done for the day, everything fits into the backpack. When everything is inside a bag, it weighs approximately 38 pounds. If at any time you experience a problem with the material or workmanship, you are covered by a 2-year full warranty from the manufacturer. This makes a lot of potential owners feel better about purchasing an inflatable SUP. Most users agree that it is easy to inflate this SUP. Some say that it takes approximately 5-6 minutes to inflate to the recommended 15psi. They also say that it is quick to deflate as well. People feel that it is very durable. Some even take their beloved larger breed dogs out with them on the water without fear of claws puncturing the Airtech. The bottom is just as durable and most do not worry about it bumping against rocks or the dock. Owners state that it tracks well, thanks to the larger removable fin. That it is ridged enough to be stable in the water. Even those who do not feel favorable about the functionality of this iSUP for themselves, says that it is perhaps a worthy investment for others. There are a lot of people who have issues attaching the pump to the board. Most say that after they get the hang of it, it becomes easier, but it can be difficult at first. There are a lot of people who have issues with the fin on this inflatable. It does not have a permanent screw and therefore it could be easy to lose. The product says you get a carrying backpack with your purchase, but most users say that you have to purchase it separately. Considering most inflatables have a way to carry everything, it may not be something you feel provides everything you need.